RALEIGH, N.C. — Seminole power was on display on Friday night as No. 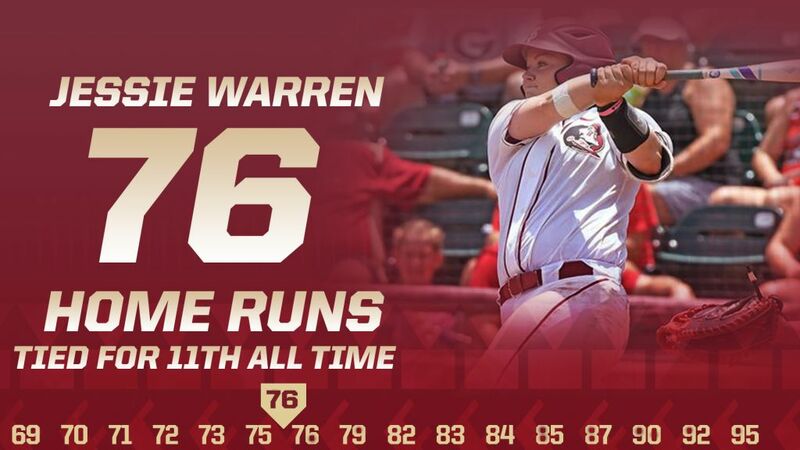 11 Florida State (42-10, 19-3 ACC) hit six extra-base hits, including three home runs, on its way to a 9-1 win in five innings over NC State (23-29, 5-16 ACC) to take game one of the series at Dail Stadium. Florida State’s aggression allowed the Noles to get an early 1-0 lead in the top of the first. Carsyn Gordon earned a one-out walk, extending her streak of reaching base safely to 31 consecutive games. Sydney Sherrill followed with a sacrifice bunt to third for out number two and Gordon sprinted past second for the vacated base. The throw from the NC State second baseman Chandley Garner was off target, allowing Gordon to score on the play. Dani Morgan lined a triple off the wall in right with one out in the top of the second inning, but a strikeout and a groundout would leave her stranded on base. The Seminoles added three more runs in the third inning, highlighted by a two-run HR by Jessie Warren, her 14th of the season. Morgan Klaevemann started the inning with a single up the middle and Warren launched the first pitch of her AB over the wall in left to make it 3-0 FSU. It was the 76th home run of her career, moving into a tie for 11th in NCAA history with Megan Baltzell (Longwood – 2012-15) and Jenny Dalton (Arizona – 1993-96). It also marked the 255th RBI of her career, passing Oklahoma’s Lauren Chamberlain for 15th all-time. The inning continued with a single by Gordon and she stole second and moved to third on a ground out. A wild pitch from NC State starter Kama Woodall allowed her to score to make it 4-0 Seminoles heading to the bottom of three. NC State scored its only run of the game by starting its half of the third with an infield single by Angie Rizzi and a walk by Haylee Kobziak with nobody out. A sacrifice bunt moved the runners into scoring position and a groundout to short allowed the Wolfpack run to score, cutting the FSU lead to 4-1. Gordon added four more runs for Florida State in the fourth with a grand slam to right field, the fourth grand slam of her career. Elizabeth Mason led off the inning with a walk and Klaevemann and Warren added a pair of infield singles to load the bases. Mason gave FSU an eight-run lead with a solo home run to centerfield. Klaevemann added a double later in the inning, her third hit of the day, but would be left stranded. Savanna Copeland entered to pitch the fifth for the Noles and retired all three batters she faced. Meghan King pitched 4.0 innings to earn the win and improve to 16-6 on the season. She scattered three hits and one run with one walk and two strikeouts. The Seminoles and Wolfpack will continue their series on Saturday, May 5 with a game at 2:00 p.m. Tickets are available at www.gopack.com and the game will be broadcast on ACC Network Extra. Links for video, FSU Softball Radio and live stats will be available on the softball schedule page of Seminoles.com.